The Linksys E1200 N300 Wireless Router lets you access the Internet through a 2.4 GHz wireless connection or by using any of its four (4) Ethernet ports. The range of this router can reach up to 250 meters. To learn more about the different Linksys Wi-Fi Routers, click here. QUICK TIP: You can resolve some of these issues by following the steps here. Built-in Parental Controls and Internet Access Policy features. To know more about this feature, click here. Wi-Fi Protected Access 2 (WPA2™) security provides encryption for data on your wireless network. Stateful Packet Inspection (SPI) firewall blocks unwanted access to your Linksys E1200. Network Address Translation (NAT) technology protects and allows your entire network to access the Internet using a single Internet IP Address. Configuring the device’s advanced settings is available through the router’s web-based setup page. To know more about the Linksys E1200, click here. Internet port - Connects your modem to your Linksys router through an Ethernet Cable. The Internet LED lights up when there is a connection made through this port. It flashes to indicate network activity over the Internet port. NOTE: Rear port lights can be turned OFF. For instructions, click here. Ethernet ports - Lets you connect a computer or any Ethernet-capable device to the Linksys router. NOTE: The LEDs at the back panel stay solid when a device is connected to the router through one of the Ethernet ports. The LEDs flash to indicate network activity over a certain port. Power LED - Lights up green when the router is powered ON. Wi-Fi Protected Setup™ (WPS) button - If you have client devices that support WPS, then you can use this button to automatically configure wireless security for your network. To learn more about the WPS feature, click here. Reset button - This allows you to reset the router to its factory defaults. Press and hold the Reset button for approximately five (5) seconds, or restore the defaults from the Administration > Factory Defaults page on the router's web-based setup page. NOTE: For Windows® 10 users, it is recommended to use the minimum requirements stated above. QUICK TIP: For more details about this product, visit the Linksys Support Site to browse for more troubleshooting articles, downloadable user guides or firmware updates and other support information. 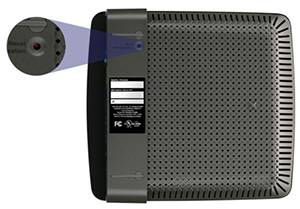 To learn more about the Linksys E1200 Router, click here.